If you’re thinkin’ of being my remake, it don’t matter if you’re black or white. Took brass balls to remake the legendary WIZARD OF OZ – or maybe just black balls. The pinky-white euphemism “urban” doesn’t disguise THE WIZ for what it is – a black version of THE WIZARD OF OZ. Dorothy (Diana Ross) is a Harlem kindergarten teacher who is transported via a snowstorm to the Land of Oz (i.e. New York on LSD), where she is told that the only person who can get her home is the powerful Wiz in the Emerald City, which she can find by easing on down the yellow brick road. Along the way, she meets three misfits who join her trek, Scarecrow (Michael Jackson), Tinman (Nipsey Russell) and Lion (Ted Ross). The story retains all the themes and messages of the original – that of belief in yourself, with each character exhibiting the characteristics they think they lack – and the throughline of seeking the Wiz for favors. Then there are the brainless messages, as when Dorothy is captured and lets all her friends get mutilated instead of surrendering her slippers to the wicked witch (Mabel King). Just when we think Dorothy has such staunch principles, the witch threatens to fry Dorothy’s dog Toto (which isn’t even cute) and she relents. Hey, nice priorities: let your friends die but don’t harm the pet. Take notes, kids. Joel Schumacher (CAR WASH) screenplays THE WIZ for director Sidney Lumet (DOG DAY AFTERNOON). Really? Two whiteys in charge? At least they retained composer Charlie Smalls’s music, augmented by Quincy Jones as MD/composer. And that makes the music – contrary to most musicals – the only redeeming factor in THE WIZ. Usually in musicals, we tune out when the action stops for the tiresome musical numbers; here, with Smalls and Jones in super funky mode, the songs are the most interesting diversions. Not all of them are catchy or enjoyable the first time round, and some may sound disco-dated, but for the most part, they raise the pedestrian level of the action tenfold. To wit: the movie’s signature song Ease On Down The Road (equivalent to the original’s We’re Off To See The Wizard); or check out the powerful tenor on Ted Ross as the Lion and the saucy brass section on his signature tune, I’m A Mean Ole Lion. (I especially like his high-heeled paws!) Like the original, the Lion garners the most laughs (until Richard Pryor appears and then it’s all laughs on him). Years on, the achievement of the monumental dance numbers in the Emerald City still amaze, with Quincy Jones cameoing as a piano player. Lena Horne cameos as good witch Glinda. And Richard Pryor is The Wiz! (Wouldn’t it have been more appropriate for The Wiz to be the great and powerful Quincy Jones?) And the same twisted messages of magic muddled with platitudes wash over us like a retarded tsunami. 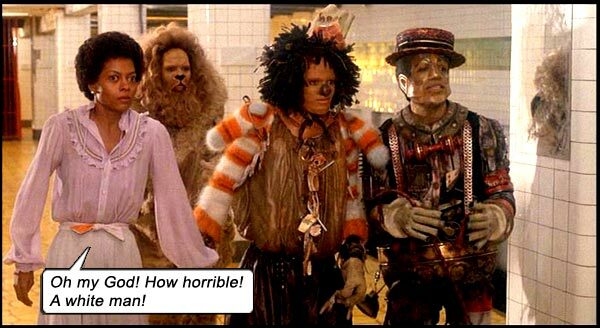 In the end (except for some of the songs) THE WIZ is as silly and badly-structured as THE WIZARD OF OZ. Only blacker. Writers: L. Frank Baum, William F. Brown, Joel Schumacher. Music: Charlie Smalls, Quincy Jones. Starring: Diana Ross, Michael Jackson, Nipsey Russell, Ted Ross, Mabel King, Theresa Merritt, Thelma Carpenter, Lena Horne, Richard Pryor.